This is the Oregon coast in the summer! It’s actually 65 degrees, but the wind makes it a lot colder! We just had a lovely picnic lunch in the sun (tomatoes are back in season!) and decided to walk on the beach to get a little exercise. This is why I carry and wear layers all the time. Underneath my jacket hood is a ski cap. Ten minutes earlier I just had a t-shirt! Don’t get me wrong, we love it! Sixty-five degrees is our perfect temperature! We are eating tons of seafood: Dungeness crab, Oregon halibut, rockfish, lingcod, shrimp and Chinook salmon. We buy it fresh at the fish market and eat it that day. We can hike in the redwoods in the morning and walk on the beach in the afternoon – heaven! It’s July and there is practically no one here in Bandon. The only downside is that the conditions have not been optimal for photography. Mr. Misadventures has to deal with weather, clouds, etc. But here we also have to deal with tides. We went scouting and spent the afternoon at Cape Arego on Wednesday and had perfect conditions, we walked a long time on the beach. We went back Thursday and it was a total bust. It is day by day when you are dealing with the sea. But you know what? We’ll take it! We had our first RV boo-boo arriving at our new site. The RV park is not super big rig friendly and somebody had their picnic table out a tiny bit too far onto the road and we scratched up two cargo doors. We’ll see if we can buff it out or have someone clean it up for us. But we went 8 months before our first mark, not bad I think (although the hubby would disagree!). 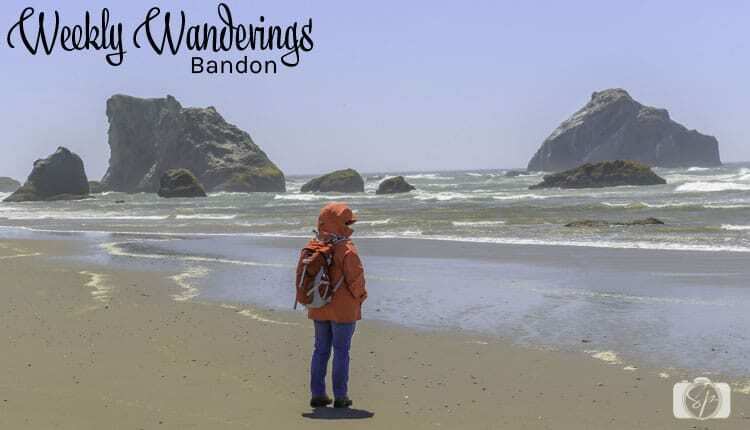 Robbin’s Nest RV Park – Bandon, Oregon. I’d love to go to Oregon. I just was in Bandon for my niece’s beach wedding. She got married on the grass knoll above Devil’s Kitchen beach. The view was fantastic but the wind unbearable. The chairs kept blowing over. They poured two different colored sand into one jar but most of it blew away when they were pouring it. Luckily the reception was inside. My Brother-in-law had smoked salmon and fresh tuna he caught 3 days before. I wouldn’t mind 65 degrees once in a while during the summer to break up the heat. The seafood must’ve tasted good. My cats would love to go there.